The yard waste season starts the first week of May and runs thru the last week of October. First, we would like to thank you for choosing Taylor Garbage for your waste and recycling needs. As a family owned, local company, we do our best to provide the utmost quality in all that we do including the service that we provide to your residence. Second, we are very sorry to announce that effective today, April 20, 2018, we will no longer be able to take certain items as recycled goods. We encourage you to read the enclosed article which gives a good overview of the state of the recycling industry globally, which is the reason why we must change our policies on what recycled products we are able to take. Please refer to the list below to educate yourself on what we are no longer able to take with your recycling. Styrofoam, plastic bags, plastic bags full of bags, sneakers and shoes, bowling balls, basketballs, footballs, wicker baskets, VCR tapes, CDs, pocket books, leaves and brush, pillows and bed sheets, plywood, shingles, pool covers, blue tarps, garden hoses, bricks, blocks and chunks of concrete, household batteries, pots and pans with food still in them, unopened canned goods, spray paint cans with paint still in them, ceramics and pottery, cookware, dishes, coffee cups, drinking glasses, window and plate glass, mirrors, plastic base to a basketball hoop with the sand still in it, plastic rope and twine, plastic banding, dirty diapers, planter pots with the dirt still in them, cardboard boxes with the styrofoam and bubble wrap still in them, carpet and linoleum, dog chains and cables. On behalf of Taylor Garbage, we appreciate your business and thank you in advance for your understanding. We truly value you as a customer and hope to continue serving your waste and recycling needs for many years to come. 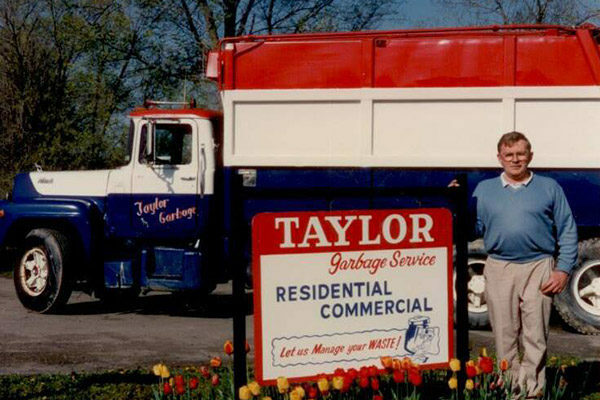 Welcome to Taylor Garbage Service, the Southern Tier’s friendly, neighborhood waste disposal company since 1978. Whether you’re a life-long customer or looking for a new waste disposal company, you’ll find everything you need here on our website. If you’re looking to clean out your garage or starting a remodel, be sure to check out our variety of roll-off containers to help you get the job done faster.